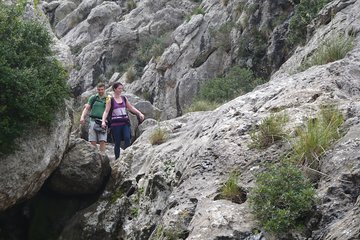 Swap the beach for a full-day hike through the Torrent de Pareis canyon and enjoy some of Mallorca’s most awe-inspiring views. Wind your way through the dramatic canyon, scramble along rocky ravines and spot local wildlife like black vulture and crag martin. Climb high mountain passes and tuck into a packed lunch (own expense) as you enjoy the impressive panoramic views. This small-group tour is limited to eight, ensuring a personalised experience. This canyon trek swaps adventure sports for a straightforward hike, with chances to spot wildlife and flora.